Richard Irwin (Belper, United Kingdom) on 15 May 2009 in Plant & Nature. In old folk-law if you wander into a ring of bluebells you will fall under a faerie spell and will soon die. Such a fearsome reputation for such an innocent flower me thinks. very grim folklore for something so beautiful!! thankfully it isn't true -- i mean, you are still alive, right? ;) lovely!! Nice angle of view Richard for this lovely bluebell ! Great contrast with this cloudy sky too. Hey Richard, Hope you arer doing good! Liked all your recent posts! Wonderful work! Best wishes! Really nice perspective and gorgeous color. Beautiful. Composition -- ready made.... I was hoping you would get this. Oh! i've not heard that before! I hope i didn't do a circle around then when I went to the bluebell wood the other week, perhaps not, only part of a circle and that's why i ended up with the flu lol. A beautifully crisp image and the colour is stunning. 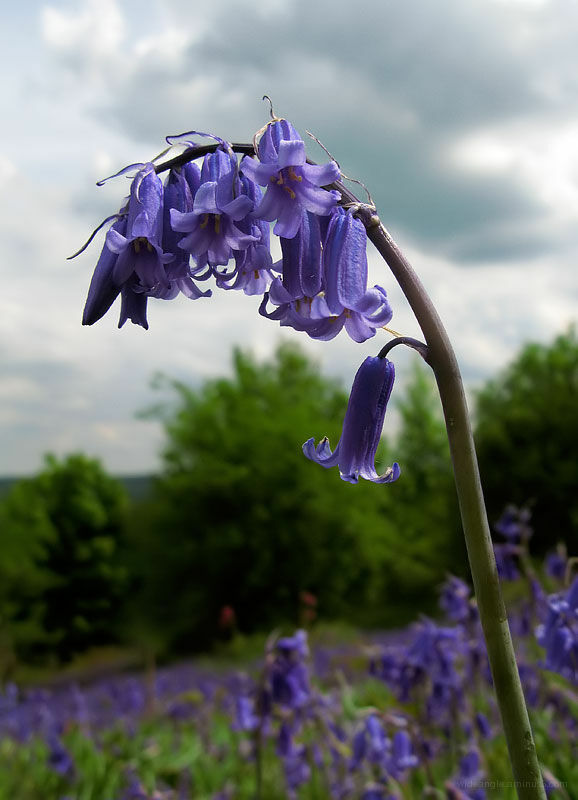 There are Blue Bells everywhere right now, and this is a prime example, it looks lovely ! Me thinks as well. Love the shooting angle. Makes it look like a giant bluebell. Methinks, too. This is so nice and sharp. I think I'd be willing to risk the dire results to wander through the bluebells. Stunning, superb perspective and excellent choice of view point. These are so beautiful. Wonderful shot. I agree and a beautiful capture of this flower as well! Who would guess that from such a beautiful flower? The angle and DOF is very nice. Very nice composition, with this PoV, and the DoF. A lovely and quality picture!